Summary Four-bay D2700 Atom NAS from ASUS-backed newcomer with HDMI, USB 3.0, eSATA ports and wide range of downloadable apps. As crowded as a market is, it seems that somebody always thinks there is room for one more player. In this case, the marketplace is Network Storage and the somebody is ASUS (more accurately, ASUSTeK Computer Inc.). Perhaps hoping to repeat the success of its RT-N66U "Dark Knight" [reviewed] and its other routers, the Taiwanese computer hardware and electronics powerhouse is hoping to take enough market share from more established competitors to carve out its own piece of an "exponentially growing market", to quote the ASUSTOR PR person who pitched the products to me for review. 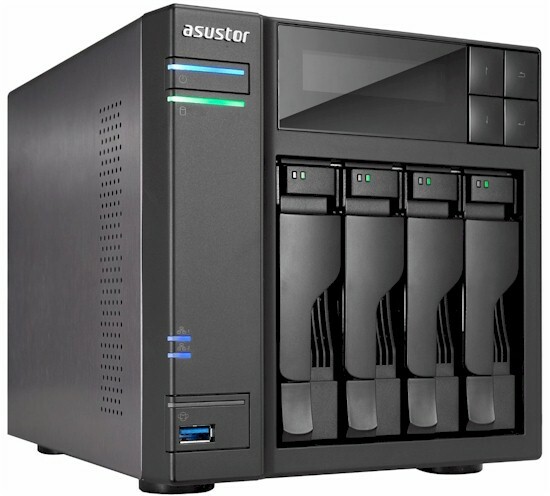 ASUSTOR's initial AS 6 lineup has two, four, six and eight bay models, all powered by dual-core 2.13 GHz Intel D2700 Atom CPUs with 1 GB of DDR3 RAM (expandable to 3 GB total). We'll be looking at the four-bay AS-604T. The 604T's built, fit and finish are reminiscent of a four-bay TS-series QNAP, with an all-metal chassis and cover and plastic front panel. Four hot-swappable 2.5 or 3.5" SATA hard or SS drives mount on unlockable trays that have light-pipes to bring activity and fault LEDs forward from their home on the drive bay backplane. The callout diagram below shows all the front panel indicators. Not called out is the USB 3.0 port or the four buttons to the right of the screen that are used to navigate through the displayed menus. I really wish the buttons were backlit, or at least had their function icons highlighted in a light color, so that you could better see what you were doing when using them. The rear panel has a pretty good set of ports including the second USB 3.0, four USB 2.0, two eSATA, two Gigabit Ethernet and HDMI. Note the really large (about 4.5") fan that moves a lot of air while spinning very quietly. Like Thecus, ASUSTOR uses that HDMI port not only for console access, but for some of its apps that enable multimedia playback. More on this later. After you install drives on the trays with supplied screws, first boot automatically flashes a message on the LCD screen asking to initialize. I replied "Yes" with four 3 TB drives loaded and got a four-drive RAID 5 volume when the initialization process finished about five hours later. I had to guesstimate this time, since the system log didn't contain an entry for the start of volume creation. The LCD screen handily displayed the NAS IP address, but I wasn't able to reach the admin screen when I entered it in my web browser. After checking the Quick Setup Guide, I found that the admin server lives on port 8000, so be forewarned. Speaking of the QSG, it and the User Manual come on a CD; there are no printed copies of either. CDs are quickly going the way of the floppy disk, so ASUSTOR should at least print out the Quick Start Guide. Especially because of its use of port 8000 for the admin interface. ASUSTOR also provides Windows and MacOS utilities on CD that can be used to find a NAS and run through the setup wizard. These can also be downloaded, but again, it would be helpful to have hardcopy to tell you this.